I loved reading my kids bedtime stories. We snuggled up in Jacob’s bed in his small teddy bear infested room or Sean’s blue nautical bed with Buzz Lightyear peeking over the edge of the toy box and read a story of either boy’s choosing every night. Sometimes they picked one of my favorites and sometimes they picked a book with awkward sentences and repetitive dialog but I read whatever they chose. Leaning back against the headboard, smelling their freshly shampoo’d little heads, I opened a book cover and Jake pointed at pictures on the page. It’s one of those things that happen every night of their lives until it doesn’t. I read Cyndy Szeckeres’s board book Puppy Too Small to Sean and Jacob more times than I can remember. Each time they asked to hear my own story of how Sean was born too early and how small he was and how my college friend Sharyn had given us that book when Sean was born. And, then they would ask me to read it again. We read Tumble Bumble and Frog and Toad and then the books got bigger. We read Because of Winn Dixie, and I cried. 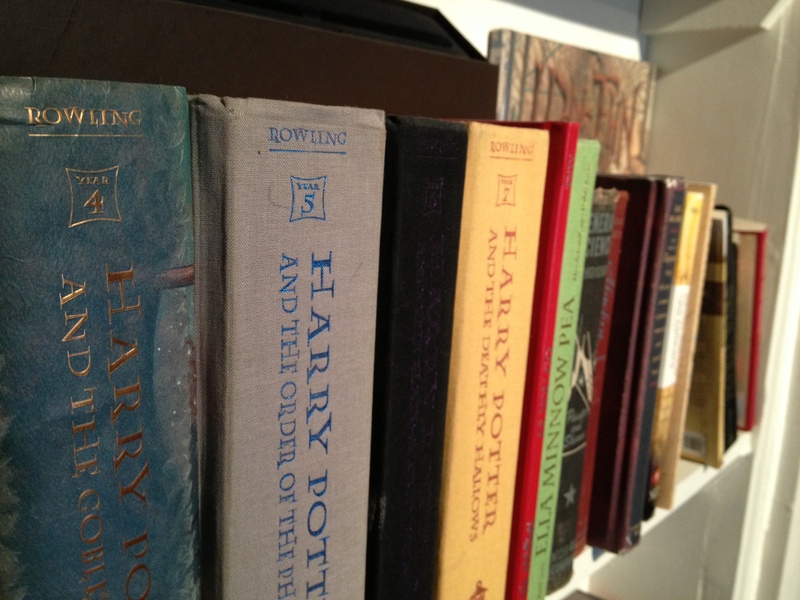 We read all the Series of Unfortunate Events and somewhere along the way we started the Harry Potter Series. Sean was a few years younger than Harry when we first began our Hogwarts adventure. I mispronounced the character’s names and stumbled over the spells but all three of us loved the story. By the time Harry was entering his fifth year at Hogwarts, Sean was reading it on his own but still joined us for out-loud reading at bedtime, though he sat at the foot of the bed now. When the final book in the series was released, Jacob was ready to read on his own, too, so I read Harry Potter and the Deathly Hallows in my own bed, without moving my lips at all. The bedtime story ritual was over before we had time to notice and today, I miss it terribly. Last night, Jacob, who is now almost 18, asked me to run lines with him for a play he’ll be appearing in soon. We sat on the couch and went through the script page after highlighted page making sure that he had his cues and was reciting the words as scripted. The play is a musical and we reached the place where Jacob is required to sing a solo. He started just talking through it then stopped and shook his head. “No, I’ve got to sing it,” he said. And so he did, and I cried. “I’m never going to make it through this play,” I laughed with tears in my eyes. “I’m just so proud of you,” I said. Tonight before going to bed, I knocked on Jacob’s bedroom door. “I used to do voices?” I asked. Read to your kids, people. Read to them every day until you don’t. And then read to them some more. I enjoyed reading this. I too used to read to our son who is now 24 years old and out on his own. I also used to make up little dialogues with his beanies. I miss those times.